Very honest, no games played, you can build your credit, just do what’s required. I see that it helps you build credit! This is my last shot at qualifying for thing but a secured credit card. Fingers crossed. Trying to rebuild my credit so I hope I get approved, it’s got good reviews so we will see. This is a good card to rebuild your credit. According to the Surge MasterCard website, this is a good card to obtain to rebuild your credit. All you have to do is make your monthly payments on time and try to utilize 30 percent or less. 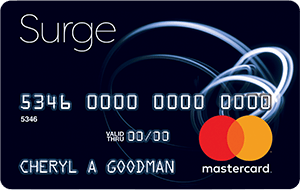 Surge will report your status to the credit bureaus and you will see that your credit score will increase. Also making on time payments will automatically increase you credit limit. I hope that you find this to be helpful so that you can make a decision and take the first step to rebuilding your credit. Well put to the point. Easy you want credit back and Pay on time you can get your credit better. Great Review i need the help real bad please.